Digitizing is an essential part of the embroidery process. We hear so many times “We have our logo on disk”. Well, this doesn’t mean it’s ready for embroidery. If you haven’t set up your logo with another company for embroidery, you most likely need to get your logo digitized. Your logo must be converted to a format specifically for embroidery machines. 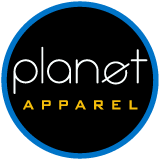 Planet Apparel offers the highest quality digitizing. We charge $10.00 per thousand stitches. An average logo is 7,000 to 9,000 stitches. Our work is always guaranteed, so there is never a risk. Start today by getting your logo digitized and soon you will be sporting your hats, polos, jackets with your organizations logo embroidered on them. 1st – * Send us a request or link to the logo using the form below. 2nd – We will send back an estimated amount of stitches for your logo. You will receive your logo w/ proof in 5 working days.